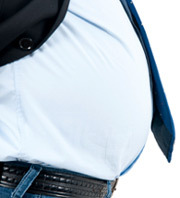 Life Insurance for Overweight and Obese Individuals - Best rates and prices. In today's society, being overweight brings with it a number of challenges. Unfortunately, being overweight may also affect the cost of your life insurance premiums quite significantly. Life insurance companies consider a number of different factors when assessing for life insurance coverage, the main ones being age, weight, height, gender, medical condition, and smoking status. With this information, insurance companies can then provide an estimate to the average life expectancy on an individual. Get the best rates if you are overweight? Life expectancy estimations are performed by life insurance companies in an effort to determine how long you will live. As an example, let's presume you are currently 30 years of age. Based upon your health parameters the insurance company estimates that you will live until you are 84. Thus there is obviously a very reasonable probability you will successfully outlive a 30 year term life insurance policy. As such, you will get a low premium on your policy. Being an overweight male or female can mean that your life expectancy is severely reduced. The research health economists at RTI concluded that being overweight may reduce an individual's life expectancy by five to eight years on average, depending on how overweight the particular individual is. Obesity combined with smoking can reduce life expectancy by as much as 21 years. The question should be asked then, is there any way to reduce the cost of a life insurance policy if you are indeed overweight? Invest in shorter term insurance. If you have a spouse and/or children, providing their financial requirements can be met with a 10 or 15 year policy, the policy will cost less since the probability of your death within that time frame is far less than if you were to invest in a much longer term policy. Opt for a health program. If you can lose weight and you also expect to remain in good health, then it's well worth considering surrendering the policy and then investing in a new one. The cost of the premiums will be lower if you do manage to lose weight. Add on a spousal insurance rider to your spouse's policy. The add-on will provide insurance against your own death. The spousal rider may well cost less than if you were to invest in an independent insurance policy. Maximize your employer's group term insurance. The way that group policies work is to average the risk between members of the group. Employers still do provide group term insurance as part of core benefits to employment which can amount to between one and two times your annual income. What's more, some employers will provide a supplemental insurance option where it's possible to add group term for as much as five times annual salary. Invest in accidental death insurance or you can add this as a rider to an existing policy. Accidental death insurance is treated separately to your current health status. This type of insurance does only cover for accidental death as the name suggests, but it still provides an inexpensive way to provide for extra death benefits. Getting a life insurance policy if you are an overweight or obese man will be more difficult due to the many health issues that being overweight can cause. The rates will also will be higher, so, if you are thinking about losing some weight, do it before applying for life insurance coverage. The above summary for men also applies for women, but, females will pay less than males for the same coverage. This is simply due to the fact that a woman's life expectancy is greater than a man's. CLICK HERE - Compare life insurance rates for overweight persons!